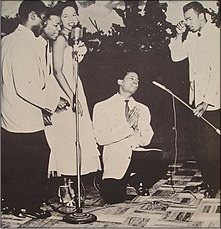 In 1956, the Platters (pictured below) recorded their biggest R&B hit – “The Great Pretender” (watch them on YouTube). Memories of that song – in particular its title – came to me when I was considering how clever the finite mind is in creating pretense. In that nondual place of infinite awareness – where objectless experience and unity consciousness reside – there is no separate self, no seeking or striving or pursuing. There is no pretending. There is only being. Awareness being itself. Sometimes, this awareness veils itself and takes on thoughts, feelings and situations so that it plays the part of a separate self, sometimes resembling a character in a play or the dreamer in a dream. This is the habitat of the finite mind, when infinite awareness disguises itself as a separate “I.” Awareness as a separate self has now entered the dualistic realm. Whether you think of the dualistic realm as a dream state, a soap opera, a version of “The Truman Show” or any other construct of the finite mind it seems like consciousness is pretending to take on a role as a separate self. To me, this makes our minds not only great pretenders but perhaps the greatest pretenders given how much chaos and pain is caused by this separatist worldview. The English language offers thousands of words that function well in the dualistic realm, making it far easier to communicate the thoughts, feelings and sensations we focus upon as objects in this realm. After all, doesn’t our common language rely on subjects and objects? Our language is dualistic! People are far more familiar and conditioned to living and working in this separatist domain. It could also be called the more “reasonable” realm. Our language doesn’t offer the same diversity of words for the nondual realm so we default to words like “oneness” or “infinite awareness” or “unity consciousness,” or even resorting to the ancient Sanskrit word “Advaita” on occasion. This less reasonable realm is almost foreign to our finite minds that forget this space of pure awareness – infinite consciousness – which is always present, inherent in our essential beingness.